The QBrand QBlog: Is Kraft putting its Nuts on the line? Is Kraft putting its Nuts on the line? Noticed at the supermarket this week: Kraft appears to be re-configuring its peanut butter product range under the name KRAFT Nuts. First to appear was the "smooth" variety, fomerly called simply KRAFT smooth peanut butter. 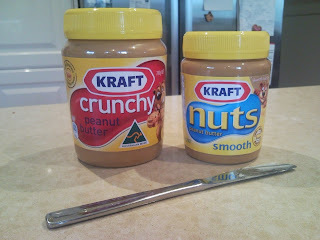 Under the new brand architecture, the same product is now KRAFT nuts peanut butter - smooth. Only a minor change, and the overall look and colour scheme are the same. So why bother going to the expense of rebranding? Well, while "Kraft Peanut butter" probably carries significant brand equity with Australian consumers, the word "smooth" and the phrase "peanut butter" are both highly descriptive and not distinctive. Hence, Kraft could only ever claim Trade Mark protection for the word Kraft itself and not for any combination. However, a search of the IP Australia Trade Marks register shows that a composite mark including the word KRAFT in its familiar hexagonal red border combined with the word nuts on a peanut-shaped graphic device was lodged in April 2009. Kraft and its lawyers obviously believe that "KRAFT nuts" with a specific graphic device is sufficiently distinctive to be granted a trade mark monopoly. This would mean convincing IP Australia that, in combination with KRAFT, "nuts" is an unsual name for a peanut butter or other spread (even though it's a highly descriptive word if applied to nuts). Strategically, this gives Kraft the opportunity to build equity in something it can own beyond the KRAFT corporate brand name, but in a way that probably won't confuse consumers. Given that I can find nothing about it anywhere on the web, this rebranding seems to be getting a very "soft" launch. But I would expect to see some new advertising featuring, and possibly explaining, the revised architecture before long. I am thinking...is there a bad association of peanut butter with being healthy? ...And thus the change. At least they have attached KRAFT to the NUTS. I used to work for a brewery which sells BEER na BEER (which means A beer that really takes like a beer). The generic branding caused a lot of stir and law suits from rival San Miguel Beer. Interesting comments. However, in our case it doesn't really matter to us what is on the label. My wife and I visited Sydney recently from Canada and bought a little jar of Kraft "Nuts". It is the best tasting peanut butter spread that we have ever tasted. And believe me I am an expert on peanut butter. It tastes so nutty!!!! Unfortunately, we are unable to purchase this in Canada. We have Kraft PB in Canada but not the "Nuts" name. Sad really. would be interested to know if the ingredients or their percentage have been changed or replaced e.g. tapioca. Just came back from a trip to Australia and fell in love with Kraft "Nuts". I bought a little jar to bring home to the USA and it's almost gone. I sure wish I could get my hands on another jar! I agree with the man from Canada. It's the best peanut butter I have ever tasted. Must be those Australian peanuts. Everything did taste better while we were there! I would love to be able to find another jar soon! jerry22 , if you really are an expert on peanut butter, you wouldn't go for most of Kraft's peanut butter which is peanuts mixed with hydrogenated oils and other stuff. 100% natural peanut butter is what you'd want and the ingredient list for that stuff is typically 100% roasted peanuts alone and depending on the type you get, may or may not have salt added. That's it!